Card Base WhipCream card stock 6 1/4 inches by 10 folded in half and creased with crease tool. Washed with Pan Pastels: Pinapple Smoothie, Sweet Berry, Candy Apple, Summer Days and Citrus Cooler. layer 1: Turbo Teal card stock stenciled with Artful Wall Stencil JM-0088 and Journey Modeling Paste. Let dry thoroughly, preferably over night. Layer 2: WhipCream card stock sprayed with Journey Splashes: Turbo Teal, Cosmic Grape, Outrageous Pink, Sour Lemon, Electric Lime. Let this dry throughly. 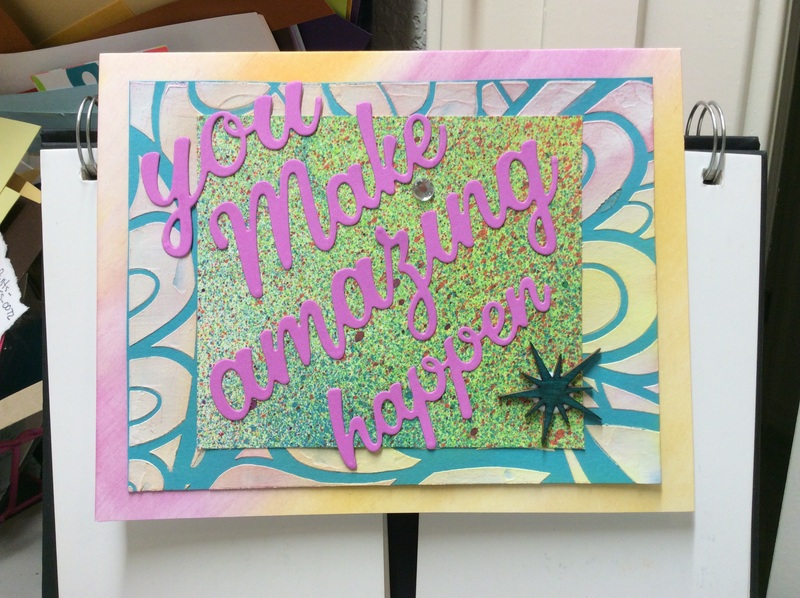 words: Cosmic Grape card stock and dies that came with the Amaze Machine and The RG Amaze Machine.